'This Is Us' Big Twist: Did the Premiere Have You In Tears? Did you see that twist coming? Chances are if you're reading this right now it means you just finished watching the highly anticipated series premiere of "This Is Us" and, to be honest, we're not sure how you can actually see through all your tears. But there's something huge we need to discuss: The massive twist at the end of the episode. Be warned: We're about to get super spoilery here so if you've managed to steer clear of ruining the ending of this pilot for yourself, please click out immediately and only return after you've watched! Okay, now that we're in a safe space, is everyone ready?! Mandy Moore and Milo Ventimiglia's Rebecca and Jack aren't just a pair of adorable hipsters sporting throwback style. They're actually living in the '70s. And the twins played by Justin Hartley and Chrissy Metz, a.k.a. Kevin and Kate? They're actually 2/3 of a trio of siblings born on the same day--and Sterling K. Brown's Randall is their brother. Oh, one other very important thing: Rebecca and Jack are their parents! After your brain actually processes this information overload--and the thrill of the '70s reveal not happening until the end of the episode--you'll probably have questions. Namely: How does this show work from week to week? It's cool that everyone is connected in this amazing way, but what will the next episode look like? Creator Dan Fogelman told reporters at the show's 2016 Television Critics Association summer press tour panel that he has a road map for the series. "It's a fair question," he admitted. "When we sold the show, we had a whole plan for the series before. When it was written, it wasn't like we are just going to make the pilot and then kind of figure it out if we get lucky enough to get on TV. John Glenn and I describe it as, like, a dramedy version of Lost where you have to understand how everyone's connected and then kind of explore these people as they move forward. He continued, "So they're interconnected Milo and Mandy's storyline jumps around in time. You can see that. There's going to be different looks we play with. And the only way I can describe it is I sometimes think about the fact that I have a great-great-grandfather out there somewhere who I never met nor do I know his name. But in his own way, he's kind of affected my life because he raised my grandparents who raised my parents who have raised me." So ultimately, the storylines will remain interconnected, and we'll be able to see the growth of the characters as the show jumps around through time. "It's really kind of ambitious, and I think, for network TV, a really bold, hopefully somewhat groundbreaking attempt to explore the condition of the human family." 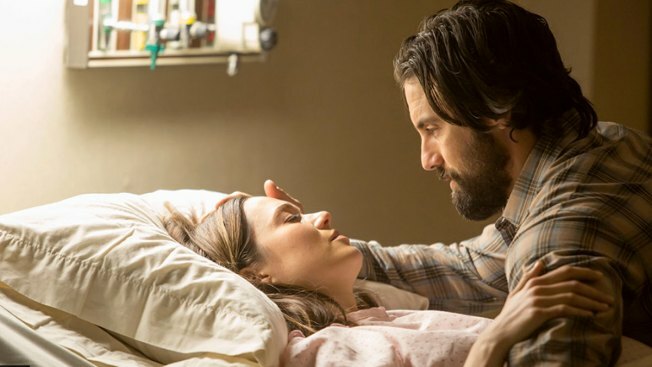 What did you think of This Is Us' big twist? Did you remain unspoiled? This Is Us airs Tuesdays at 10 p.m. on NBC. Original Post: About This Is Us' Big Twist: Did the Premiere Have You In Tears?